Save $3 through Saturday Only! Three heartwarming holiday tales in one. Bridget O’Brien lost her fiancé to a dangerous job. And, while she’d love to have a relationship like the one she lost, the last thing she wants is one with another man who willingly puts his life in danger. Luke Foster is a motocross racer whose track record with women runs short and no-strings-attached on both sides. He’d never seriously pursue a forever-after woman like Bridget. All they want is a holiday week away. Bridget from her well-meaning family’s condolences about her planned Christmas Eve wedding and her memories of a future that won’t be. Luke from his family’s annual critique at which he and his life choices always fall short of expectations. But, under the blue Caribbean skies, anything can happen. Sparks fly from a Christmastime reunion of motocross racer Jesse Brewster and his ex-girlfriend Lauren Cooper. 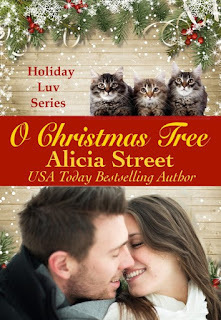 Being thrown together to plan the race team's Christmas party reignites a flame Lauren thought she'd extinguished when she broke up with Jesse six months earlier. But will Jesse's well-meaning secret Christmas gift—meant to help win her back—compromise the independence Lauren is fighting to establish? Is it, as she maintains, the wrong time for their love? Jilted at the alter two weeks ago, motocross champion Royce Evans plans to make an appearance at the Team Macachek Christmas party to show the guys he’s just fine. Then he’ll hunker down alone at the team barracks for the rest of the holiday season. Out-of-work investigative reporter turned pizza delivery person Samantha Linder needs money for her younger sister’s special school tuition and needs to re-establish her cred as a reporter. When a freak winter rain storm strands them alone at the barracks, they strike a bargain that benefits them both. But after Sam appears to break that bargain, can even the spirit of Christmas save their blossoming love? 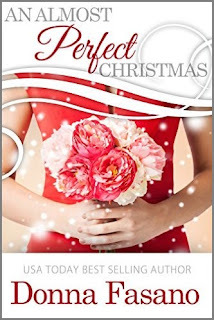 For fans of ‘Me Before You’ and ‘The Fault in Our Stars’—An Almost Perfect Christmas brings together two people in need of the kind of love that can overcome tragedy. A heartbreakingly romantic novel that challenges each of us to live—and love—to the fullest… even when life is less than perfect. Christmas Ball? Check. Quaint small town with an uncertain future? Check. Handsome, exasperating, human roadblock to every new idea? CHECK! 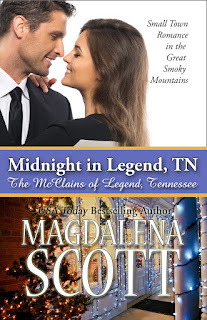 NYC transplant Midnight Shelby has her work cut out for her, if she's going to create a life in Legend, Tennessee. Single dad Martin McClain wants to keep Legend as idyllic as when he was a kid. Legend's future - and theirs - may depend on a compromise. Nothing in her successful career in New York City could have prepared Midnight for a small town holiday in Legend, Tennessee. Downtown is as pretty as a postcard, and annual events like the Christmas Ball and community Christmas Eve service warm her heart. She risked everything by investing in the big building on Main Street that she found on a realtor's website. Folks are nice enough, but the shop she's dreamed of, selling locally-made arts and crafts, hasn't a chance until the community accepts and trusts her plans. One man in particular stands in her way. Martin McClain was born and raised in the Legend area. His family has lived there for generations, and he feels a duty to preserve the past. The website his son Daniel created is good for business, but although Martin is a real estate agent by trade, he’s wary of newcomers’ motivations. Especially Midnight Shelby, who seems bent on changing everything...even him. Legend has struggled for years. Local employment is at an all-time low, and most graduates of Legend High have no chance of making a living in the town where they were raised. Now a new company making big promises is in talks with the mayor and town council. The people of Legend have always worked together in times of crisis. How will they survive this one? Piper knows what it takes to endure and hope in the face of the odds, especially at Christmas, so when the ruggedly handsome man with the desolate look in his face steps into her cat cafe to deliver a box of stray kittens, something tells her it could be a very special holiday. Wonderful books and wonderful bargains! Thanks so much, ladies!